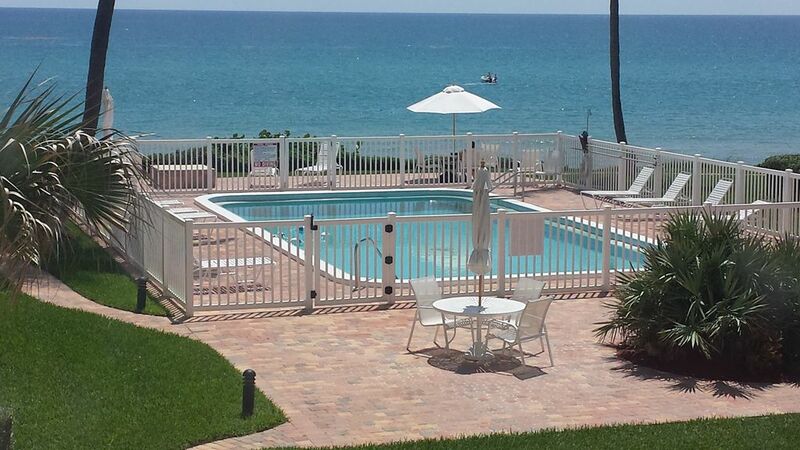 This condominium is on the second floor of a private, four story, oceanfront building in Delray Beach. The building has a private pool and beach as well as an elevator. The unit is nicely furnished and freshly painted. The unit also has great views of the ocean and wall mirrors throughout. There are two bedrooms. One of the bedrooms has a spectacular ocean front view. There is one bathroom. However, the vanity and sink is in a separate room and is separated by a door from the tub and toilet. The condominium is centrally located. It is one-and-one-half miles from Atlantic Avenue, 20 minutes from the West Palm Beach Airport, 25 minutes from Fort Lauderdale, 45 minutes from Miami, and two-and-one-half hours from Walt Disney World in Florida. Sixty-day minimum. Available October through May and June through September. I reside and work in New Jersey. The condo is in an extremely private area with a private beach. I consider it paradise. I love to swim in the pool and the ocean, take a walk on the beach and just relax looking a the beautiful ocean. For dinner I love to go to Atlantic Ave where you can eat fabulous food and browse in the unique shoppes. That is why I love my condo. There is nothing more relaxing that vacationing there. I can't wait to retire and live there year round although I have a ways to go! I have been enjoying this condo building since I was a child. My grandmother owned a unit. I found it so peaceful and relaxing to be directly on the ocean. The building sits on a private beach. I always wanted to own a unit and when the opportunity arose I bought one. I cannot imagine vacationing anywhere else. This is truly a piece of paradise. Also, the surrounding area offers wonderful restaurants, golf and tennis courses,shopping and water activities. This is an experience you will want to return to year after year. In this picture I am on the catwalk of the building with the ocean in the background. This is truly a unique place. This location is ideal. It is 20 minutes from Palm Beach Airport, 25 minutes to Ft. Lauderdale, 15 minutes from Palm Beach and minutes from all of the restaurants and shoppes on Atlantic Ave. It is directly on the ocean with a private pool and beach. Shopping and restaurants are less than a 5 minute drive. Also, there are golf and tennis courses within a 5 minute drive. Bathroom is well set up. Tub and toilet is in one room and vanity and sink in another room. Building is directly on Ocean.